FAYETTEVILLE, Ark. — Bobby Petrino talked time and again about winning a national championship at Arkansas. From the day he was hired in 2007, Petrino never wavered in that goal or belief. Petrino won't have that chance now, felled by scandal, and he blamed no one but himself for being fired. "The simplest response I have is: I'm sorry," he said. "These two words seem very inadequate. But that is my heart." Athletic director Jeff Long dumped Petrino on Tuesday and laid out a stunning laundry list of misdeeds against the man he hired away from the Atlanta Falcons four years ago. 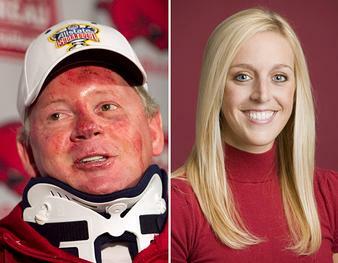 He ripped Petrino for hiring his mistress and for intentionally misleading him about the secret relationship that was laid bare following their April 1 motorcycle ride together that ended in a crash. He said Petrino missed multiple chances over the past 10 days to come clean about an affair that had crossed the line from infidelity into workplace favoritism. "He made the decision, a conscious decision, to mislead the public on Tuesday, and in doing so negatively and adversely affected the reputation of the University of Arkansas and our football program," Long said, choking up as he discussed telling players that their coach was gone. "In short, coach Petrino engaged in a pattern of misleading and manipulative behavior designed to deceive me and members of the athletic staff, both before and after the motorcycle accident." The 51-year-old Petrino, a married father of four, maintained an inappropriate relationship with 25-year-old Jessica Dorrell for a "significant" amount of time and at one point gave her $20,000, Long said. Long would not disclose details of the payment, or when the money changed hands, but said both parties confirmed the "gift." Kevin Trainor, a spokesman for Long, said the money came from Petrino, not university funds. Petrino issued a lengthy apology and said he was focused on trying to make amends to his family. "All I have been able to think about is the number of people I've let down by making selfish decisions," he said. "I chose to engage in an improper relationship. I also made several poor decisions following the end of that relationship and in the aftermath of the accident. I accept full responsibility for what has happened." Dorrell, a former Razorbacks volleyball player, worked for the Razorbacks Foundation before she was hired by Petrino on March 28, four days before the accident on a rural road 20 miles outside Fayetteville. Long said she was one of three finalists out of 159 applicants and got the job after an unusually short time frame. Petrino never disclosed his conflict of interest in hiring Dorrell or the payment and she clearly had an unfair advantage over the other candidates, Long said. "Coach Petrino abused his authority when over the past few weeks he made a staff decision and personal choices that benefited himself and jeopardized the integrity of the football program," Long said. Petrino has built Arkansas into a national power over four seasons, including a 21-5 record the past two years, and he was in the middle of a seven-year contract under which his salary averaged $3.53 million per year. A clause gave Long the right to suspend or fire the coach for conduct that "negatively or adversely affects the reputation of the (university's) athletics programs in any way." Long said Petrino was fired "with cause" — meaning he will not receive the $18 million buyout detailed in the contract — and there were no discussions about ways to keep Petrino at Arkansas. Long met with Petrino on Tuesday morning to inform him there were grounds for termination and that the coach was "concerned" about that. Long sent Petrino a letter that afternoon to formally notify him he had been fired. "I chose to do it in writing because that's the terms of his contract," he said. She was "at one point" engaged to Josh Morgan, the athletic department's director of swimming and diving operations, according to a person with knowledge of the situation who spoke on condition of anonymity because the details have not been disclosed. The person said Morgan was still employed at the university. Petrino finishes his tenure at Arkansas with a 34-17 record in four seasons, leading the Razorbacks to a No. 5 final ranking last season and a Cotton Bowl win over Kansas State. With quarterback Tyler Wilson, running back Knile Davis and others coming back, there is talk of Arkansas challenging the two powerhouses in the SEC West, national champion Alabama and national runner-up LSU. And maybe the Hogs will. But they won't do it with Petrino. The beginning of the end came on April 1, which Petrino at first described as a Sunday spent with his wife at an area lake. Instead, he and Dorrell went for an evening ride and skidded off the road in an accident that left him with four broken ribs, a cracked vertebra in his neck and abrasions on his face. The avid motorcycle rider said the sun and wind caused him to lose control. What he failed to mention, at a news conference two days later and to Long for two more days, was the presence of Dorrell other than a vague reference to "a lady" who had flagged down a passing motorist. That changed when the state police released the accident report. Petrino, tipped off by the state trooper who usually provides security for him during the season, informed Long 20 minutes before the report was released, and he admitted to what he called a previous inappropriate relationship with Dorrell. Long put him on paid leave. It didn't get any better for Petrino. Audio of the 911 call reporting the accident revealed he and Dorrell didn't want to police called following the crash, and a subsequent police report showed he asked if he was required to give the name of the passenger during the accident. Petrino was forthcoming about Dorrell's name and presence with investigators, but only after misleading both Long and the public during his news conference. The school even released a statement from Petrino's family the day after the accident that said "no other individuals" were involved. The deception and the way Dorrell was hired were too much for Long. "Our expectations of character and integrity in our employees can be no less than what we expect of our students," Long said. "No single individual is bigger than the team, the Razorback football program of the University of Arkansas." The coach's tenure with the Razorbacks began under a cloud of second-guessing following his abrupt departure from Atlanta 13 games into the 2007 season. Petrino left farewell notes in the lockers of the Atlanta players rather than telling them of his resignation in person. He was introduced later that night as the new coach of the Razorbacks, carrying with him a vagabond image after holding 15 jobs for 11 different programs/organizations in 24 seasons. He infamously met with Auburn officials in 2003 to talk about taking the Tigers' head coaching job while Tommy Tuberville still had it. Yet he was welcomed in Arkansas and took the school to its first BCS bowl game following the 2010 season, losing in the Sugar Bowl to Ohio State. He improved his win total in every year. Arkansas was 5-7 his first season in 2008, 8-5 the second before finishing 10-3 and 11-2 during his last two seasons. In his statement, Petrino said he and his staff had left Arkansas in better shape and wished for its success. "As a result of my personal mistakes, we will not get to finish our goal of building a championship program," he said. "My sole focus at this point is trying to repair the damage I've done to my family. They did not ask for any of this and deserve better. I am committed to being a better husband, father and human being as a result of this and will work each and every day to prove that to my family, friends and others. "I love football. I love coaching. I of course hope I can find my way back to the profession I love. In the meantime, I will do everything I can to heal the wounds I have created." Assistant head coach Taver Johnson will continue to lead the program through spring practice, which ends with the school's spring game on April 21. Long said he has asked the rest of the staff, including offensive coordinator Paul Petrino, Petrino's brother, to remain at least through then.